1) Heat oil in a large, heavy skillet over medium-high heat. 2) Meanwhile, season trout with salt and seasoning. Dredge in cornmeal to coat. 3) Add trout to hot skillet and cook until browned on both sides, turning once, about 8 minutes total. Transfer cooked trout to a large serving plate. 4) Melt butter in a small skillet over medium; add sour cream and whisk until smooth. Cook until heated through, about 4 minutes, stirring. Add lemon juice and stir well. 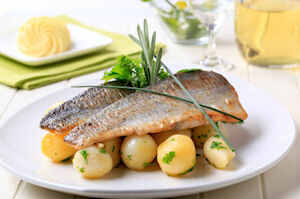 5) Pour sauce over trout and serve immediately. While an unusual ingredient for fried fish, honey really makes the flavors of golden trout pop.